If you follow me on any social media platform, then you probably noticed I was in Grenada for two weeks over Thanksgiving. Brandy and I got the opportunity to attend the Pure Grenada Nutmeg Spice Festival during that time. 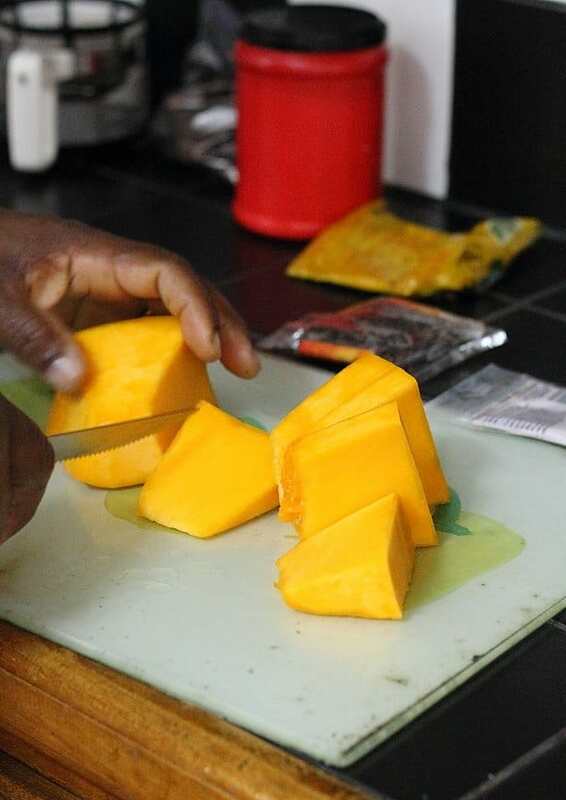 We spent two weeks in the warm Grenadian weather (and I do mean warm, because I’d say about 90% of the island doesn’t believe in air conditioning), eating our way through the different native foods. There was A LOT of fish consumed, dessert every night (not very conducive to bikini weather and the beach that was 50 yards from our front door), fruits I’ve never heard of and nutmeg in literally e.v.e.r.y.t.h.i.n.g we ate. Even with all that deliciousness going on, one of the most memorable and best days of the trip was when Jen, one of the people working with the Pure Grenada Nutmeg Spice Festival, brought us into her home and had her Grenadian husband show us how to cook some traditional Grenadian food; chicken stew, pumpkin mash, callaloo and sorrel juice. 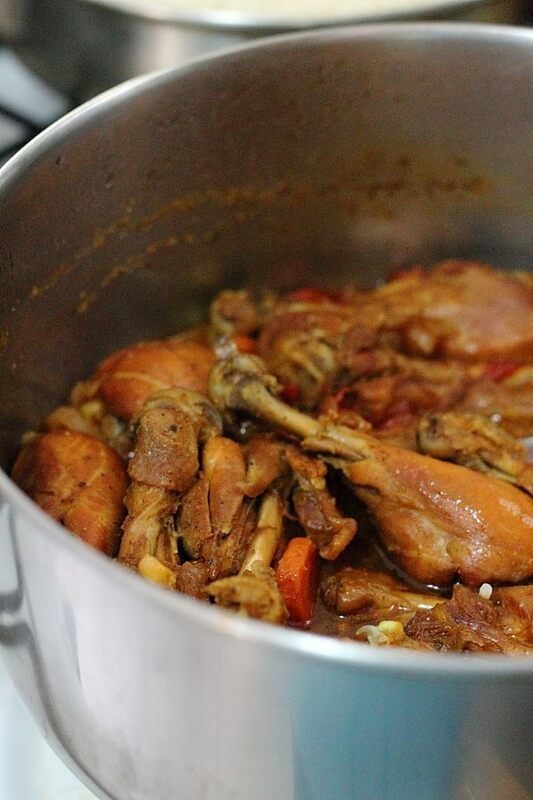 Starting with the chicken stew, we learned a few things about Grenadians. First, they’re fanatical about cleaning their chicken properly. I found this to be super interesting considering I posted the question about rinsing or not rinsing your chicken before cooking on Facebook recently and it ended up being the most engaged/controversial threads I think my page has ever seen (some people get a little cray about chicken apparently!). Well, Grenadians would be in the rinse group. And not only rinse, but rinse, then clean with fresh lime juice, then rinse again, peel the skin off and rinse one more time. Jen’s husband, Christopher, grew up without electricity for a good part of his life and learned some pretty interesting food saving and cleaning techniques to keep food safe without the need for refrigeration. I thought the lime rinse was genius and I’ve already started doing that at home now. 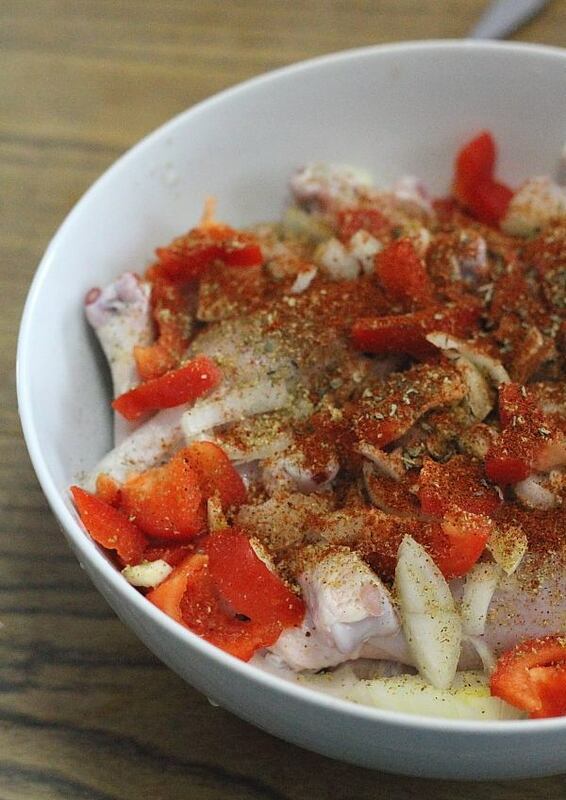 As far as prep, after the drumsticks were cleaned and the skin peeled off, Christopher simply added onion, garlic, red bell pepper, carrots, curry powder and a mixed chicken seasoning that had things like basil, dill and paprika in it. 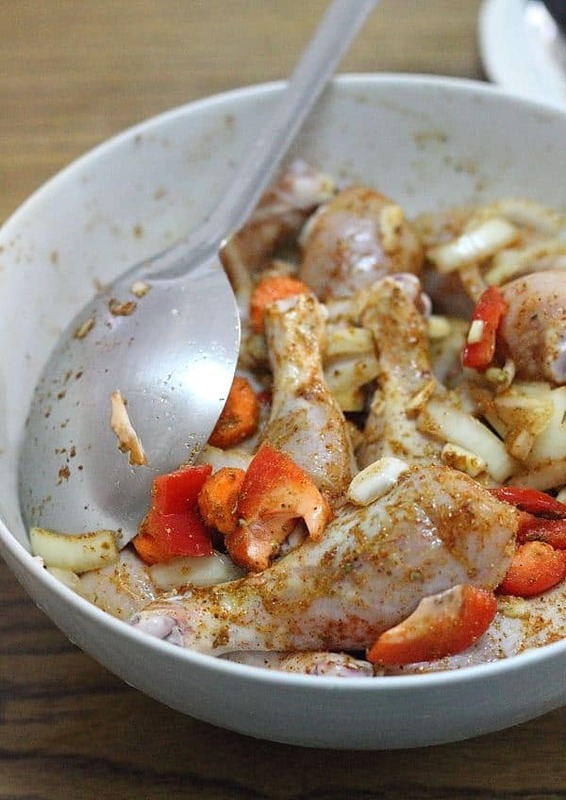 The really interesting and unique part about this stew is the sugar caramelization that goes on in the bottom of the pot before the chicken gets added. Christopher simply poured a large spoonful of regular sugar into a hot pot. He let it melt and then as it started to go through the stages from clear to yellow to brown, he stirred constantly right up until it was a deep bubbling brown. At that point you have about 10-15 seconds until it starts to burn. You want to take it right up until the burn point but not past. It’s definitely a learned skill. My gut would’ve added the chicken too soon and I can easily see how you could overshoot it as well. When the sugar gets to this point it’s almost not even sweet any more but a deep savory flavor that just adds the perfect depth to the chicken. The chicken gets added to the pot, mixed up and then enough water is poured in to reach the top of the chicken without covering it. Christopher’s secret ingredient at the end? Just a touch of ketchup is added before covering the pot. I asked a few questions at this point like if chicken broth was ever used instead of water. Answer? No. 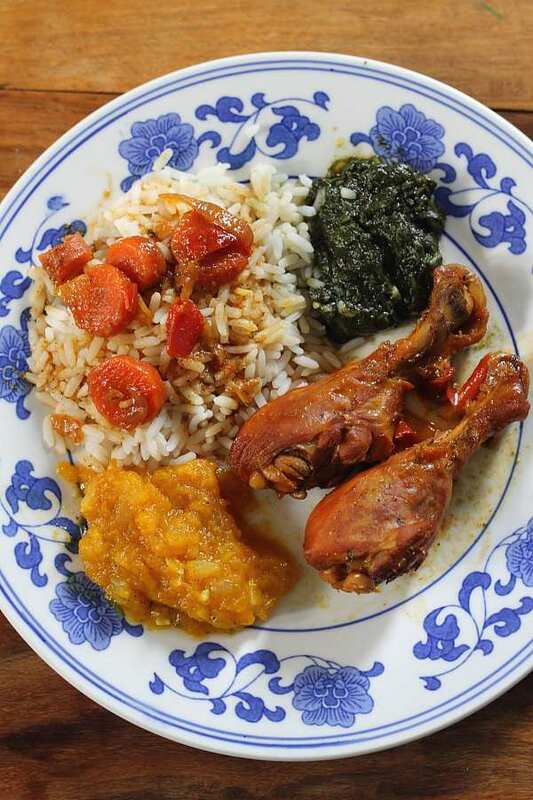 Mostly because this is a traditional dish made from simple ingredients and meant to feed families cheaply. Why use broth when water is fine? The other question was what about tomato paste or sauce instead of ketchup? Answer? Again, no. The latter two impart too much tomato flavor into the stew while the ketchup doesn’t. There’s nothing tomato-y about this stew (unlike a lot of American stews) so those would change the flavor profile too much. It all cooks down and simmers for about an hour until it’s the delicious brown color above with just enough juice left to serve. As side dishes, we made pumpkin mash and callaloo. Pumpkin grows rampant on the island, something I found sort of odd. A place with palm trees and exotic fruits isn’t the first location I’d think of to have native pumpkin, but alas, they do. Lots of it. Pumpkin is everywhere and like nutmeg, in pretty much every dish you’ll find on any restaurant menu. The thing that struck us though was that it’s never prepared sweet, always savory. Never with the spices we think of traditionally going with pumpkin (cinnamon, nutmeg, brown sugar, etc.) but rather in mashes with onions and garlic. Considering they put nutmeg in pretty much everything, the fact that they don’t put it in pumpkin made me literally laugh out loud. 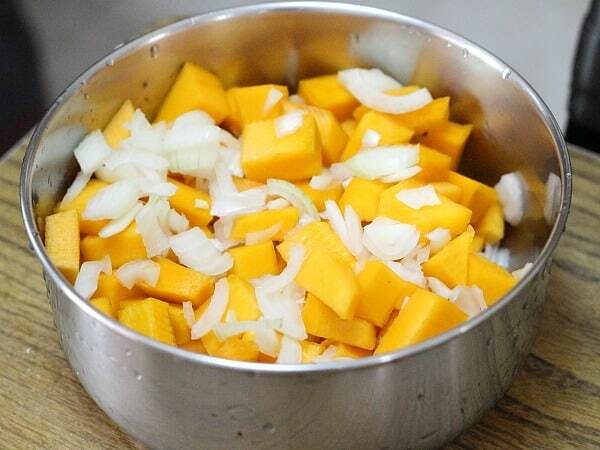 Our pumpkin side dish was just a simple chop of pumpkin, onions, garlic and a pinch of curry. It gets boiled with a little bit of water (not too much because you don’t drain it) until soft and then mashed down into a puree. Callaloo is to Grenada what spinach is to Americans. This stuff is THE green leafy vegetable of the island and like pumpkin and nutmeg, it’s on every menu, in every dish and everyone eats it. 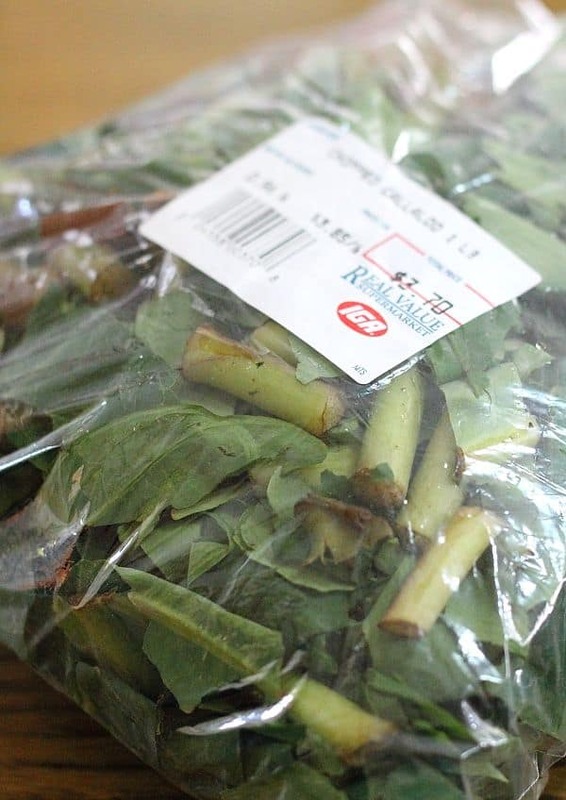 Unlike spinach, however, you can’t just do a quick saute of callaloo. It needs to be cooked down until almost mushy as the leaves and stems are just too tough to eat without the long cook time. In that way it kind of reminds me of collard greens. 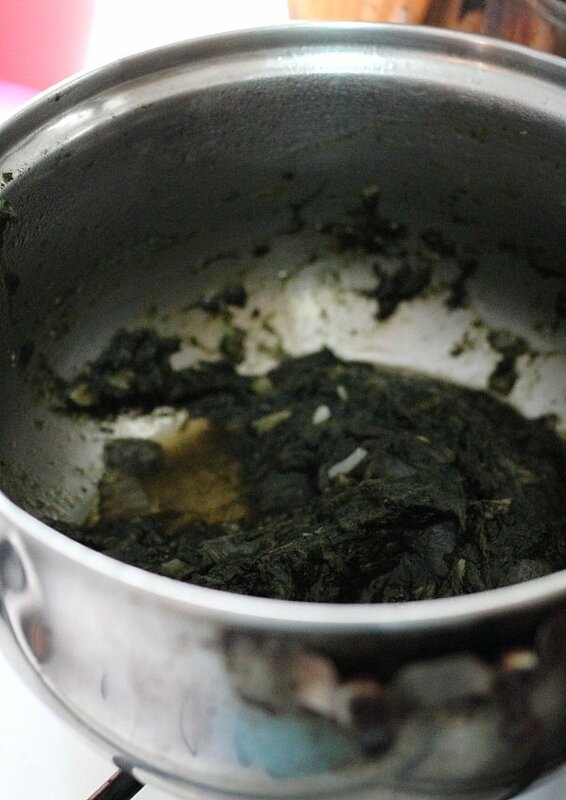 For our callaloo mash, again, we just added a little bit of water, garlic, onion and nutmeg, cooked it over high heat and mashed it into the dark green puree you see below. The last thing we made was sorrel juice. 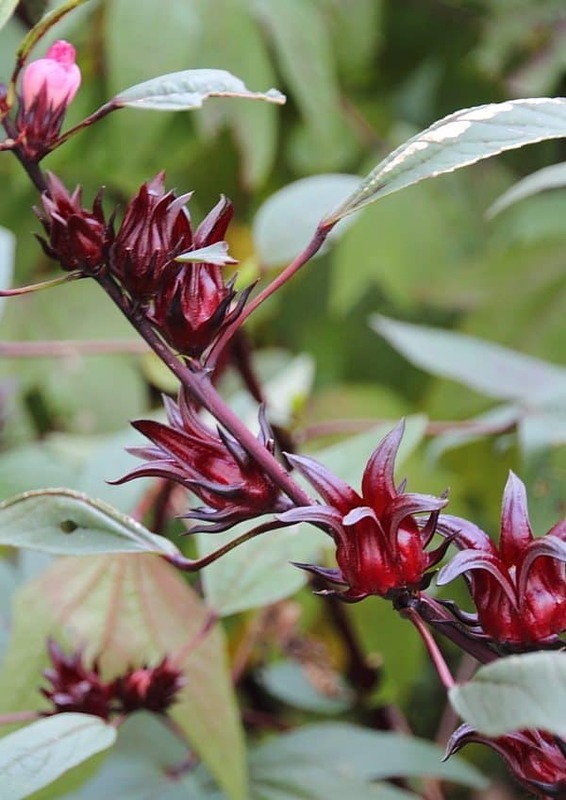 This flower which is a relative of the hibiscus plant grows everywhere on the island, including Jen and Christopher’s backyard (along with breadfruit, peas, pineapple, okra and banana – can you even imagine a garden like that?!) and finding sorrel juice is like finding orange juice in the states, it’s everywhere. The flowers of the plant are plucked and boiled in water with fresh ginger and cinnamon sticks for 15 minutes. The heat is then turned off and you let it steep until it cools. 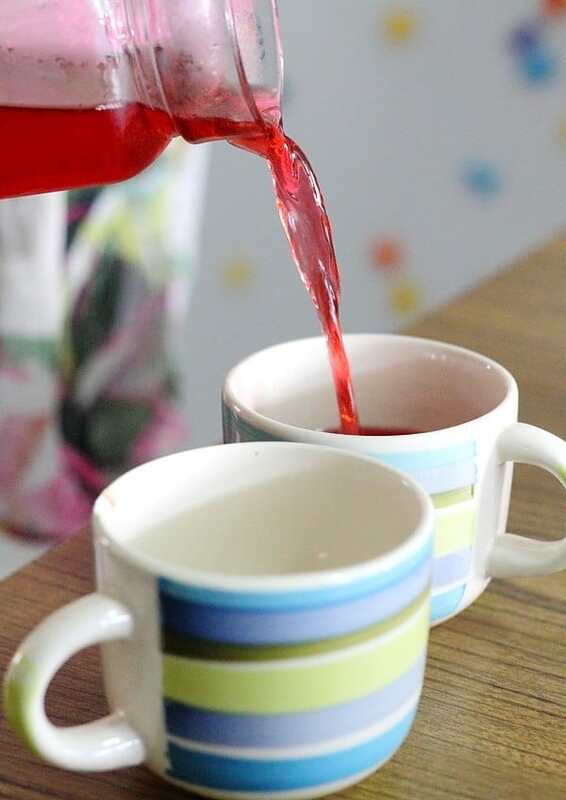 Sugar is added to your preference (I found a lot of the sorrel juice to be too sweet for my liking and would’ve loved a less sugary version to let the natural flavor come through a bit more) and then simply poured and enjoyed. And since a half gallon of Tropicana was the equivalent of about $9 U.S. in the grocery store, I think I’d be drinking homemade sorrel juice instead too. I got about 5 bites of all this wonderful food before having to head out the door for a Hash run in the northern part of the island (basically a run through the muddy forest following a trail of confetti with a bunch of beer and food afterwards- more on that later but one word for now: epic) but even after all the glamorous food we ate and it’s perfect presentation, this was definitely one of the best tasting meals of the trip. sounds like a really great trip!! I’m just lucky to be a grenadian the food here is great if you haven’t been here u need to visit the food is to die for.